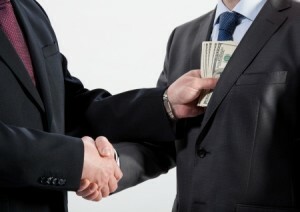 Purchasing Training ~ Bribery, Corruption & Kickbacks! It Happened Again! Bribery, Corruption, & Kickbacks! Now why am I bringing this up in my blog? Well, I have been saying over and over that the corporate and government focus on putting all of their code of conduct and conflict of interest training and auditing on procurement alone is a big mistake. I am convinced, just completely convinced, that most of the bribery and kickbacks happen not within procurement itself, where everyone expects it to happen and is paying the most attention, but with other powers that be – executives and especially end users. In the government sector, you see it more with those in executive functions, and with the private sector, you see it more with end users. I have so many firsthand accounts I’ve seen, and guess what, I was blind to all of this when I was working procurement like you were. Do you think just because you are not doing it, then therefore nobody else is doing it either? I have news for you: if that’s what you think, chances are you are wrong… dead wrong. It’s happening. I tell you, it’s happening. Remember: every company that focuses all of this energy on training their procurement organizations on code of conduct expectations writes a completely different set of rules for the sales organization inside the very same company. And who do you think the suppliers try to sell, you or the internal customer (end user)? You guessed it, they try to sell the internal customer. And they do whatever it takes to land the deal. I work with a lot of suppliers. I hear all their stories, because they are unashamed to tell me. It’s the way things go; it’s expected in the sales profession. I asked him how this could be. He said “Simple. Two sets of season tickets to the xxxxx football team”. I’m not going to say the team name. Another supplier told me he paid off a senior government official who then promptly mandated the purchase of that solution for his entire state organization. Another individual told me of a senior government official that mandated the procurement of a particular product that was being sold by his own company. Purchasing told him this wasn’t the lowest cost or total cost option and he told them “just buy these from this company.” And that’s exactly what happened, in plain view for all to see. I know someone else who lives in a very nice mansion on a very nice lake. How did this lowly engineer generate these kind of funds? Simple. He told all his major suppliers: “if you want my company’s business, you need to give me 8%, in gold or cash.” And they do. I saw another major company have an ENTIRE division of their company in South East Asia fall to corrupt practices – bribery and kickbacks, from the President on down. It started at the top. The whole division got shut down. I helped shut them down in fact. I’m telling you, if you think this is not happening under your nose, you are crazy. And I was crazy for 18 years, as a Fortune 50 Purchasing Executive, when I thought it wasn’t happening under my nose either. Sometimes you have to be on the outside looking in before things are readily apparent. a) Get over your “this doesn’t happen where I work” beliefs. Just throw those beliefs out the window. b) Stop the focus just on the procurement department for code of conduct training and audits. Executives and end users need to get the same level of scrutiny. c) Get trained in Risk Assessments, Controls, Risk Management, and take control of your internal audit organization and tell them what to audit to. They have no clue otherwise, despite their great training as auditors. My Power Purchasing Pro Training Program tells you exactly how to do the above – plus many other focus areas that comprise the 7 Deadly Sins of Purchasing. You don’t want to be doing this kind of training after an excursion. Otherwise you will be like the person who gets fire insurance *after* your house has burned down. That’s a bad place to be. And in all likelihood, the fire has already been burning right under your nose, and you and most everyone else in your firm or agency is unaware. If it happened to me, it can happen to you. Keep pushing for excellence and integrity in our profession. Don’t wait for someone else to do it….. It has to start with you.